Ted Pella, Inc announces the availability of the new Pelcotec™ CDMS series Critical Dimensions Magnification Standard. These new calibration standards have been developed for easy, quick and precise magnification calibration over a wide magnification range for SEM, FESEM, FIB and CD-SEM. The affordable Pelcotec™ CDMS calibration standards are manufactured using a conductive ultra flat silicon substrate with precise chromium deposition for all feature sizes from 2mm to 5µm. For feature sizes from 2µm to 100nm a 50nm gold over 20nm chromium deposition has been used. The Cr and Au/Cr on Si provide excellent contrast in both SE and BSE imaging mode. The features are easier to detect than on etched Si standard and since all the materials involved are conductive there are no charging issues with this standard. 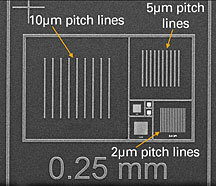 Feature sizes smaller than 10µm are nested for quick navigation. Pelcotec™ CDMS-1T and -1C; Traceable or certified versions with features from 2.0mm to 1µm for a magnification range of 10x - 20,000x. Ideal for desk top SEMs and low to medium SEM applications. Pelcotec™ CDMS-0.1T and -0.1C; Traceable and certified versions with features from 2.0mm to 100nm for a magnification range of 10x – 200,000x. Useful for low to high resolution applications for SEM, FESEM, FIB and CD-SEM. The size of the standards is 2.5 x 2.5mm with a thickness of 625µm. They are available either un-mounted or mounted on a choice of SEM sample stub. Due to its sturdy construction, the Pelcotec™ CDMS standards can be easily cleaned using a plasma cleaner.